For other uses, see Fatima Jinnah (disambiguation). Fatima Jinnah (Urdu: فاطمہ جناح‎; 31 July 1893 – 9 July 1967) was a Pakistani dental surgeon, biographer, stateswoman, and one of the leading founders of Pakistan. After obtaining a dental degree from University of Calcutta in 1923, she became a close associate and an adviser to her older brother Muhammad Ali Jinnah who later became the first Governor General of Pakistan. A strong critic of the British Raj, she emerged as a strong advocate of the two nation theory and a leading member of the All-India Muslim League. After the independence of Pakistan, Jinnah co-founded the Pakistan Women's Association which played an integral role in the settlement of the women migrants in the newly formed country. She remained the closest confidant of her brother until his death. After his death, Fatima was banned from addressing the nation until 1951; her 1951 radio address to the nation was heavily censored by the Liaquat administration. She wrote the book My Brother, in 1955 but it was only published 32 years later, in 1987, due to censorship by the establishment, who had accused Fatima of 'anti-nationalist material'. Even when published several pages from the book's manuscript were left out. Jinnah came out of her self-imposed political retirement in 1965 to participate in the presidential election against military dictator Ayub Khan. She was backed by a consortium of political parties, and despite political rigging by the military, won two of Pakistan's largest cities, Karachi and Dhaka. The U.S. magazine, Time, while reporting on the 1965 election campaign, wrote that Jinnah faced attacks on her modesty and patriotism by Ayub Khan and his allies. Jinnah died in Karachi on 9 July 1967. Her death is subject to controversy, as some reports have alleged that she died of unnatural causes. Her family members had demanded an inquiry, however the government blocked their request. She remains one of the most honoured leaders in Pakistan, with nearly half a million people attending her funeral in Karachi. Her legacy is associated with her support for civil rights, her struggle in the Pakistan Movement and her devotion to her brother. 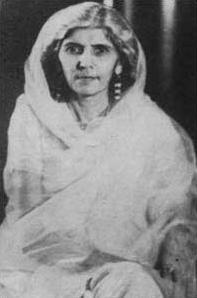 Referred to as Māder-e Millat ("Mother of the Nation") and Khātūn-e Pākistān (Urdu: — "Lady of Pakistan"), many institutions and public spaces have been named in her honour. Fatima was born on 31 July 1893, the youngest of seven children to Jinnahbhai Poonja and his wife Mithibai, in a rented apartment on the second floor of Wazir Mansion, Karachi. Fatima had six siblings: Muhammad Ali, Ahmad Ali, Bunde Ali, Rahmat Ali, Maryam, and Shireen. Of her siblings she was the closest to Muhammad Ali Jinnah who became her guardian upon the death of their father in 1901. She joined the Bandra Convent in Bombay in 1902. In 1919, she was admitted to the highly competitive University of Calcutta where she attended the Dr. R. Ahmed Dental College. After she graduated, she opened a dental clinic in Bombay in 1923. She lived with her brother until 1918, when he married Rattanbai Petit. Upon Rattanbai's death in February 1929, she closed her clinic, moved into her brother Muhammad Ali Jinnah's bungalow, and took charge of his house. This began the lifelong companionship that lasted until her brother's death on 11 September 1948. Paying tribute to his sister, Muhammad Ali Jinnah once said, "My sister was like a bright ray of light and hope whenever I came back home and met her. Anxieties would have been much greater and my health much worse, but for the restraint imposed by her". She accompanied her brother to every public appearance that he made. During the transfer of power in 1947, Jinnah formed the Women's Relief Committee, which later formed the nucleus for the All Pakistan Women's Association (APWA) founded by Rana Liaquat Ali Khan. She also played a significant role in the settlement of Muhajirs in the new state of Pakistan. In the 1960s, she returned to the forefront of political life when she ran for the presidency of Pakistan as a candidate for the Combined Opposition Party of Pakistan (COPP). She described her opponent, Ayub Khan, as a dictator. In her early rallies, nearly 250,000 people thronged to see her in Dhaka, and a million lined the 293-mile route from there to Chittagong. Her train, called the Freedom Special, was 22 hours late because men at each station pulled the emergency cord, and begged her to speak. The crowds hailed her as Madr-e-Millat, (Mother of the Nation). In her speeches, she argued that by coming to terms with India on the Indus Water dispute, Ayub had surrendered control of the rivers to India. She narrowly lost the election, winning a majority in some provinces. The election did not involve direct democracy of the population, and some journalists and historians believe that if it had been a direct election she could have won. Jinnah, popularly acclaimed as the Madr-e-Millat, or Mother of the Nation for her role in the Freedom Movement, contested the 1965 elections at the age of 71. Except for her brief tour to East Pakistan in 1954, she had not participated in politics since Independence. After the imposition of martial law by Ayub Khan, she once wished the regime well. Yet after martial law was lifted, she sympathised with the opposition as she was strongly in favour of democratic ideals. Being sister of her beloved brother, she was held in high esteem, and came to symbolise the democratic aspirations of the people. The electoral landscape changed when Jinnah decided to contest the elections for the president's office in 1965. She was challenging the dictator and self-proclaimed "president" Ayub Khan in the indirect election, which Ayub Khan had himself instituted. Presidential candidates for the elections of 1965 were announced before commencement of the Basic Democracy elections, which was to constitute the Electoral College for the Presidential and Assembly elections. There were two major parties contesting the election, the Convention Muslim League and the Combined Opposition Parties. The Combined Opposition Parties consisted of five major opposition parties. It had a nine-point program, which included restoration of direct elections, adult franchise and democratisation of the 1962 Constitution. The opposition parties of Combined Opposition Parties were not united and did not possess any unity of thought and action. They were unable to select presidential candidates from amongst themselves; therefore they selected Jinnah as their candidate. Elections were held on 2 January 1965. There were four candidates: Ayub Khan, Fatima Jinnah and two obscure persons with no party affiliation. There was a short campaigning period of one month, which was further restricted to nine projection meetings that were organised by the Election Commission and were attended only by the members of the Electoral College and members of the press. The public was barred from attending the projection meetings, which would have enhanced Jinnah's image. Ayub Khan had a great advantage over the rest of the candidates. The Second Amendment of the Constitution confirmed him as President till the election of his successor. Armed with the wide-ranging constitutional powers of a President, he exercised complete control over all governmental machinery during elections. He utilised the state facilities as head of state, not as the President of the Convention Muslim League or a presidential candidate, and did not hesitate to legislate on electoral matters. Bureaucracy and business, the two beneficiaries of the Ayub Khan regime, helped him in his election campaign. Taking advantage of political opportunities, he brought all the discontented elements together to support him; students were assured the revision of the University Ordinance and journalists the scrutiny of the Press Laws. Ayub Khan also gathered the support of the ulema who were of the view that Islam does not permit a woman to be the head of an Islamic state. Jinnah had detached herself from the political conflicts that had plagued Pakistan after the founder's death. The sight of her moving through the streets of big cities, and even in the rural areas of a Muslim country, added to her popularity. She proclaimed Ayub Khan to be a dictator. Jinnah's line of attack was that by coming to terms with the Republic of India on the Indus Water dispute, Ayub had surrendered control of the rivers over to India. Her campaign generated tremendous public enthusiasm. She drew enormous crowds in all cities of East and West Pakistan. The campaign however suffered from a number of drawbacks. An unfair and unequal election campaign, poor finances, and indirect elections through the Basic Democracy System were some of the basic problems she faced. Jinnah won the popular vote in the presidential election of 1965. However through post election rigging, coercion and manipulation of the electoral college, Ayub Khan got himself elected as the President of Pakistan. It is believed that had the elections been held via direct ballot, she would have won. The Electoral College consisted of only 80,000 Basic Democrats, who were easily manipulated. The importance of this election lay in the fact that a woman was contesting the highest political office of the country. The orthodox religious political parties, including the Jamaat-e-Islami led by Maulana Maududi, which had repeatedly declared that a woman could not hold the highest office of a Muslim country, modified their stance and supported the candidature of Jinnah. The election showed that the people had no prejudice against women holding high offices, and they could be key players in politics of the country. During a lawsuit, Matloobul Hassan Syed deposed that during Jinnah's election campaign against General Ayub Khan, when some local Shia leaders told her that they would vote for Ayub, she contended that she could represent them better as she was a Shia. According to Liaquat H. Merchant, "the Court was inclined to repose more trust in the avowed non-sectarian public stance of the Quaid and his sister". Both Muhammad Ali Jinnah and his sister "carefully avoided a sectarian label." Jinnah's unfinished biography of the Quaid, My Brother, was published by the Quaid-i-Azam Academy in 1987. Fatima Jinnah died in Karachi on 9 July 1967. The official cause of death was heart failure, but rumours persist that she was murdered at her house at the behest of the military junta. In 2003, the nephew of her and Quaid-e-Azam, Akbar Pirbhai, reignited the controversy by suggesting that she was assassinated. She is buried next to her brother, Muhammad Ali Jinnah, at Mazar-e-Quaid, Karachi. A monument in Fatima Jinnah Park containing a commemorative plaque. At this park, the government built a shiny tin statue of Jinnah. Jinnah remained extremely popular and is considered as one of the greatest female figures Pakistan has produced. Jinnah is a source of the awakening of women's rights. In Pakistan, she rose to stand as Pakistan's national symbol, and unlike Ayub Khan who died in poor health and yet no honours were given him, Jinnah received tremendous honours from the society after her death. Later, the Government of Pakistan built a monument in honour and remembrance of her. ^ a b c Afshan Bokhari (2008). Bonnie G. Smith (ed.). The Oxford encyclopedia of women in world history (V 1 ed.). Oxford University Press. p. 653. ISBN 978-0-19-514890-9. ^ "In brief By Ali Iqbal". Dawn Weekly. Archived from the original on 28 June 2013. Retrieved 14 April 2013. ^ "50 Years Ago Today: A message from Fatima Jinnah". Dawn. 12 September 2012. Retrieved 14 September 2016. ^ Akhtar Balouch (27 December 2014). "The deleted bits from Fatima Jinnah's 'My Brother'". Dawn. Retrieved 14 September 2016. ^ Nadeem F. Paracha (4 May 2014). "Fatima Jinnah: A sister's sorrow". Dawn. Retrieved 14 September 2016. ^ "When Ayub Khan Accused Fatima Jinnah Of Being An Indian And American Agent | Pak Tea House". pakteahouse.net. Retrieved 14 September 2016. ^ "Pakistan: Trouble with Mother". Time. 25 December 1964. ISSN 0040-781X. Retrieved 14 September 2016. ^ "Art of killing without a trace". The Express Tribune. 15 September 2012. Retrieved 14 September 2016. ^ "New twist to Miss Jinnah controversy". Dawn. 23 July 2003. Retrieved 14 September 2016. ^ Akhtar Balouch (24 January 2015). "How Fatima Jinnah died — an unsolved criminal case". Dawn. Retrieved 14 September 2016. ^ a b c d "Death anniversary of Fatima Jinnah tomorrow". Pak Observer. Archived from the original on 24 December 2013. Retrieved 12 February 2012. ^ Anne Commire (20 July 2000). Women in World History. Gale. ISBN 978-0-7876-4067-5. Retrieved 23 December 2012. ^ Hector Bolitho (2006) [First published 1954]. Jinnah, Creator of Pakistan. Oxford University Press. p. 14. ISBN 978-0-19-547323-0. ^ Moniza Inam (11 February 2012). "A long drawn struggle". Dawn. Retrieved 4 October 2016. ^ a b c Khaled Ahmed (23 May 1998). "The secular Mussalman". The Indian Express. Archived from the original on 18 November 2007. Retrieved 19 September 2007. ^ Irfan Zafar (9 July 2011). "Book Review: The nation was orphaned, forever". Daily Times. Archived from the original on 3 March 2016. Retrieved 9 June 2014. ^ "Fatima Jinnah: Mother Of Nation (Mader-e Millat)". Pakistan Herald. Archived from the original on 1 April 2012. Retrieved 31 December 2011. ^ Sangh Mittra; Bachchan Kumar (2004). Encyclopaedia of Women in South Asia: Pakistan. Gyan Publishing House. pp. 125–. ISBN 978-81-7835-189-6. Retrieved 23 December 2012. ^ "MPs asked to protect women's rights". Dawn. 29 July 2003. Retrieved 12 February 2012. Fatima Jinnah (1987). My Brother. Quaid-i-Azam Academy. ISBN 969-413-036-0.